Because it is a very high quality but moderately-priced ultra wide angle zoom lens, the Canon EF 17-40mm f/4L USM Lens is one of Canon's best selling lenses. The 17-40 f/4L fills out the bottom focal length range of Canon's f/4L zoom lens series. It is the lightest L lens currently made (1.1 lbs / 475g) and is the smallest L zoom lens currently produced (3.3" x 3.8" / 83.5mm x 96.8mm - DxL). As indicated by the "ultra wide angle" designation, the 17-40mm focal length is ultra wide on a full-frame DSLR. Let's take a look at a focal length comparison. I know, the 30mm focal length is a somewhat unusual choice for this comparison, but ... I didn't plan to use this set of images this way - I was just shooting the scene. Obviously, 17mm is vastly wider than 40mm. Utilizing Ring USM, the Canon EF 17-40mm f/4L USM Lens focuses very fast, quietly and accurately. The focus and zoom rings are nicely sized, turn smoothly and are nicely damped. This lens does not extend with a very small exception - the objective end lens elements move in/out slightly inside the lens barrel during focusing. The movement is 100% behind the filter threads. If you have a filter installed, you will have no external movement. Since the filter attaches to the fixed lens barrel - the filter also does not rotate. Circular Polarizer Filter and split/graduated neutral density filter users will care about this. The common 77mm filter threads make sharing filters with many of Canon's complementing lenses easy. The 17-40 L is weather-sealed but requires a UV Filter to complete the sealing. Wide open center of the frame sharpness ranges from great on the wide end to good on the long end. Wide open corner sharpness is also relatively good, but as usual, the corners are not as sharp as the center. Stopping the 17-40 L down to f/5.6 brings along a nice improvement in sharpness. Common landscape apertures f/8 through f/11 look very good. The 17-40 L resists flare very well. Colors and contrast are very good. CA (Chromatic Aberration) is very well controlled, though some can be expected in the corners below 24mm. Distortion ranges from moderately strong barrel distortion at 17mm to mild pincushion at 40mm with 24mm being the approximate point of minimal distortion. As usual, closer distances resulted in stronger distortion and significantly less distortion will be noticeable on 1.6x FOVCF bodies. You will likely notice the barrel distortion in the full-frame 17mm ISO 12233 resolution chart sample crops. A 7-blade circular aperture delivers excellent OOF (Out of Focus) blur quality. But, unless you have a close subject and a wide aperture, do not expect a diffusely blurred background with this ultra-wide angle focal length range and moderate maximum aperture opening. Vignetting will be a non-issue when the 17-40 L is mounted on 1.6x FOVCF bodies. Full frame body users will see vignetting ranging from very strong at 17mm f/4 to not bad at 40mm f/4 and 17mm f/8 (improvements gained with focal length increase and aperture opening reduction). A standard thickness UV filter shows little or no additional vignetting regardless of the camera body being used. However, you will likely want a slim circular polarizing filter. Although not as fast as the Canon EF 16-35mm f/2.8L lens, the Canon EF 17-40mm f/4L USM Lens is a comparable lens in terms of image quality. The biggest difference between the 17-40 and the similar-focal-length-covering 16-35 L is price. The 17-40 is much less expensive - practically half the price. But of course, the 16-35 is able to let in twice as much light. See the Canon EF 16-35mm f/2.8L II USM Lens Review for a comparison to the newer 16-35 L Lens version. The above size comparison photo includes from left to right the Canon EF 17-40mm f/4L USM Lens, Canon EF 24-105mm f/4L IS USM Lens, Canon EF-S 17-55mm f/2.8 IS USM Lens and Canon EF 24-70mm f/2.8L USM Lens. The same lenses are show fully extended below (the 17-40 L does not extend - it remains the same length at all focal lengths). At its closest-focusing-distance of 11" (280mm), the 17-40 L delivers a very respectable maximum magnification of .25x at 40mm. Zooming out to 17mm at this distance will yield a dramatic perspective. Adding extension tubes to the equation shortens the closest focusing distance and delivers significant (macro-realm) .83x and 1.02x maximum magnifications for 12mm and 25mm tubes respectively. As you expect from an "L" lens, the 17-40's build quality is very high. Focus and zoom rings are nicely sized, nicely positioned and turn smoothly. The size and shape make it a great-handling lens. And being the lightest-at-this-time L lens, the 17-40 L does not carry a weight penalty for this quality. This is an easy-to-take-with-you lens. The 17-40 L ships with a Canon EW-83E lens hood and a Canon LP1319 soft lens pouch. The shape of the hood (very wide and very short) makes one question whether it actually helps. It does almost nothing for lens protection - and nearly nothing for image quality when used on a 1.6x FOVCF body. It also makes storage inefficient. With the hood removed, the 17-40 easily fits in a relatively small Lowepro Lens Case 1W. To accommodate the diameter of the hood installed, the 17-40 requires a relatively large Lowepro Lens Case 4S. Since 1.6x camera bodies do not need all of the image this lens presents, a more-light-reducing lens hood can be used. Friends of the site have reported that the Canon EF 24mm f/1.4L Lens' EW-83DII lens hood and the Canon EF 24-105mm f/4L IS Lens' EW-83H work well as alternatives for these bodies. I tested the EW-83J from the Canon EF-S 17-55mm f/2.8 IS Lens and it seems to work fine on the 17-40. It fits and does not cause vignetting at 17mm and f/4. It looks a lot better as well. Shown above are the Canon EF 17-40mm f/4L USM Lens, Canon EF 16-35mm f/2.8L USM Lens, Canon EF 16-35mm f/2.8L II USM Lens and Canon EF 24-70mm f/2.8L USM Lens. The same lenses minus the 24-70 L are shown below with their included lens hoods. Be sure to read my Canon EF 16-35mm f/2.8L II USM lens review to determine which of these Canon Ultra Wide Angle lenses is right for you. In brief - If you are going to shoot primarily with narrow apertures or your budget is restricted, the decision is easy - get the Canon EF 17-40mm f/4L USM Lens. If you need to shoot in low light conditions such as indoors without a flash or tripod, then the 16-35 L II is a better choice (you need at least f/2.8 - or image stabilization for motionless subjects). If you do not need full-frame compatibility, rugged build quality or environmental sealing, the newer Canon EF-S 17-55mm f/2.8 IS USM is another great solution. 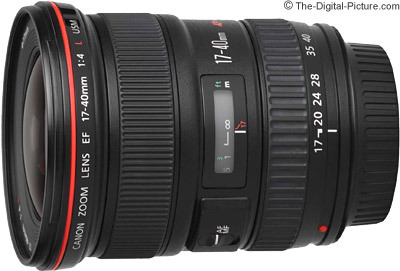 I frequently recommend the Canon EF 17-40mm f/4L USM Lens as a general purpose lens for those with a 1.6x FOVCF (field of view crop factor) camera that want the best image quality for a reasonable price. The focal length range of this lens is not dramatic, but on a 1.6x body, the full-frame equivalent 27.2-64mm lens can handle many general purpose needs. Good full-frame compatibility and performance make the 17-40 L an especially good lens for those thinking of upgrading to such a body in the future. 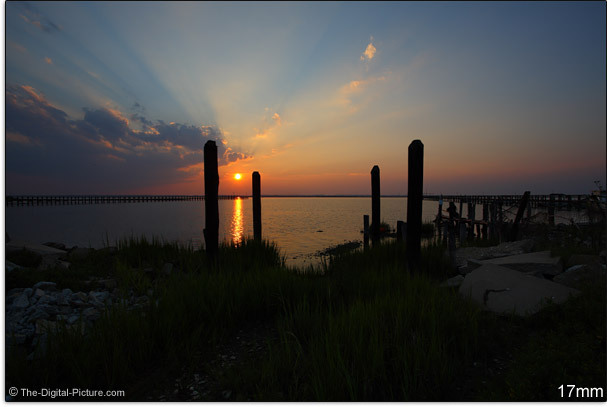 The 17-40 L makes a great second or third lens in a full frame kit. Architecture and real estate photography often have large subjects that require wide angle lenses. These are many more good uses for the 17-40 L. You may need to remove the barrel distortion from 17mm shots during post-processing if straight lines are present near the edges of the frame. Other situations that require you to work in a tight space may be right for the 17-40 L.
Although the 17-40 L can be a good people lens, it is not a good short-distance people lens. A head shot from this lens will emphasize the subject's nose more than the subject will want. The 17-40mm focal length range is great for group pictures, environmental portraits and full body pictures. Stand back and make a person part of a wide landscape shot. If tighter portraits are your interest, look for a lens that gives you at least an 85mm - 135mm equivalent focal length. The captures of your important subject will be more pleasing. Of course, that close-up wide angle portrait look is fun to use sometimes. Just don't overdo it. As with any other general purpose/ultra wide angle lens, this lens has far more uses than I am going to think of. But if you want a great wide angle lens for an attractive price, the Canon EF 17-40mm f/4L USM Lens is a very good choice. Should I Get the Canon EF 16-35 f/2.8L II, EF 16-35mm f/4L IS or the EF 17-40mm f/4L Lens?